The Human Alliance Forces Navy is well thought of by their C.A.F. counterparts but the ships they are using are getting old and there is a need to be either upgraded or replaced by more modern ships. Many different ideas have been presented but none was ever implemented and fleet was getting out of date slowly. The planet of New Coventry has a recent reputation of technical achievement and when one of the New Coventry ship captain captured a Kurganov class missiles cruiser from pirates. After using the ship to help with some local troubles, they immediately designed an upgrade for the missile cruiser and began upgrading the ship. The design impressed the Human Alliance Navy Leadership and they purchased the plans for the upgrade and gave a contract to New Coventry to upgrade some of the Human Alliance’s own Kurganov class cruisers. At the same time, they also asked New Coventry Shipbuilding to come up with a plan for upgrading the Everest class. They also asked their own engineers but New Coventry Engineers plans were finished first. This was partially due to the fact that New Coventry has more experience with upgrading ships in recent years but also because the Human Alliance has multiple other priorities for its own engineers including the development of several new classes and upgrade designs for other vessels. Along with the payment for the designs for upgrading the gun cruisers, several Everest class cruisers will be upgraded in New Coventry shipyards. 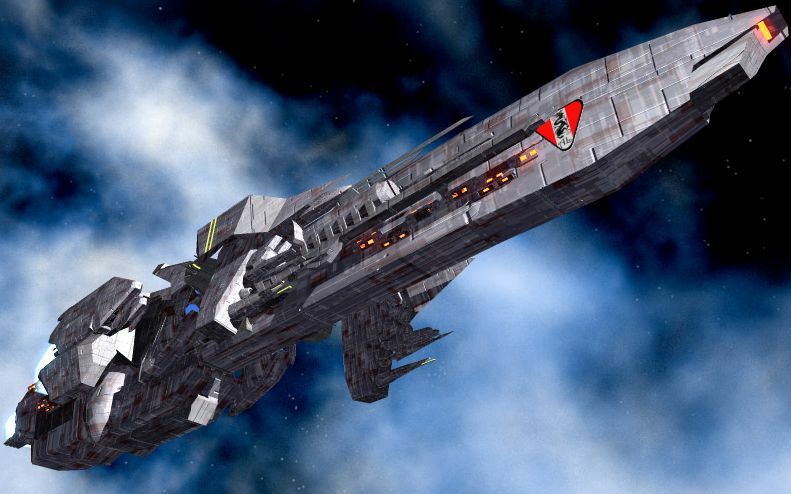 While the Human Alliance offered some Everest class gun cruisers as payment for the upgrades, New Coventry declined. Generally New Coventry prefers missile heavy designs and the Warsprite class already is an energy weapon heavy design. The actual fleet size under the command of the Human Alliance is about a quarter of the total amount of tonnage of ships as the Consortium Armed Forces have. This holds across multiple classes of vessels including cruisers. This also holds in both active and mothball fleets as well. Some ships in mothballs have been hardly in operation, having been retired soon after completion, and all their systems are in excellent shape. The present plan is to start with the ships in the Mothball Fleet and upgrade all the ships that are in good condition. Any ships in either the mothball or active fleet which are in poor shape will either be sold or scrapped depending on the exact condition. It is estimated that the Human Alliance Navy will be able to keep that active fleet at 100% of present level but the mothball fleet will only be at about half of present levels after all upgrades are finished. The selling or scrapping of the other should pay for a good percentage of the upgrades to the fleet although the cost of upgrading the fleet will still be in the trillion of credits. This plan will in all likely hood take between five and ten years to complete. The first of the Everest cruisers which was upgraded is the HFS Rosetta. The cruiser was named after a planet that scientists discovered artifacts from a race that far predates humans and it is believe that the culture existed almost one billion years ago. The ship was only eight years old when it was put in the mothball fleet and was considered in the best condition of any of the Everest class. Incredibly, the engines started right up for its long trip to be refitted. The cruiser was refitted in New Coventry dock number eight and the refit required four months. It has been followed by seven more gun cruisers a couple of months later and four more are almost complete. Because these ships are expected to enter direct combat more often than the Kurganovs are, increases in both the armor and shields was more important than it was for the missile cruiser class. The ship’s armor was also easier to replace than it was for the Kurganov. The ship’s main armor belts was removed and replaced by belts that are constructed from stronger alloys. The variable shields were replaced by a more powerful generator system. This was likely one of the hardest upgrade because the systems are deep inside the ship. Between the two additions, the ship can withstand a good amount of abuse more than it could originally but the ship is still not as anywhere near as tough as the new Champion class heavy cruiser being constructed by the Consortium. The engines would have been too expensive and too difficult to upgrade and as a result they were not upgraded along with other ship systems. As a result the gun cruiser is a bit on the slow side in both faster than light speed and normal space acceleration when compared to newer ship classes and even the Kurganov class. Because of this, the Kurganov and Everest class almost always operate tactically and strategically separate. All computer and sensor systems have been upgraded with more modern systems. These upgrades increases sensor ranges and the ship’s ability to process data. Weapon systems were all upgraded along with the sensor systems. The particle beam batteries of the gun cruiser have been removed from the ship and have been replaced by powerful laser cannons. Unlike the heavy energy weapons on the Thunderer class battleship, these heavy laser mounts are new. These inflict more damage and have about thirty percent longer range but do have a slower rate of fire. One problem has been that the ships would sometimes run into other ships that are impervious to energy weapons. For this reason, two of the four 12 cm laser cannons have been replaced by 8 cm heavy anti-ship rail guns. The anti-fighter weaponry of the gun cruiser was altered into the same layout as most New Coventry ships carry. The ship has a total of four GR-1000 heavy point defense rail guns, six point defense particle beams, and four tachyon scatter beams. The long range missile launchers were replaced by more modern and higher capacity launchers. While payload is identical to the original Everest class, throw rate is increased by fifty percent. The mini-missile launcher were replaced by four medium range missile launchers. Approximately half of the cruiser’s cargo capacity had to be cut to store the extra ammunition for the missile launchers. As a final feature, these ships will most likely carry sixteen “Pepperbox” launchers which will gives the ship the ability to throw sixty-four cruise missiles in an initial firing. Fire control has been upgraded to be able to use these box missile launchers. A second use of these box launchers is to carry only a pair loaded with decoy missiles. Fighter and troop numbers have not been changed but the crew has been reduced by the addition of more automation. The automation allows for a reduction in crew of approximately ten percent. Fighter compliments are to be replaced by newer fighters as the ships are upgraded. Model Type: CA-34 (FRAM I). Crew: 282 (ship can be run by 80 crew) - 22 Officers and 260 enlisted. Troops: 120 marines, 15 Silverhawk Pilots, and 24 fighter pilots. SH-CCW100 Silver Hawk Power Armors. SF-69 Scorpion Light Star Interceptors. SF-101 Black Eagle medium fighter. SF-101I Storm Eagle medium interceptor. 6,000 a side (36,000 Total). Shields positions can be varied and all could be combined in one shield. Shields regenerate at the rate of 5% (1,800 M.D.C.) per melee round. Maximum Range: Effectively Unlimited by either Drive system. Carries about four years worth of supplies on board. Length: 720 feet (219.5 meters). Height: 280 feet (85.3 meters). Width: 450 feet (137.2 meters). Weight/Mass: 185,000 tons (168,000 tons). Power System: Anti-Matter with a 25 year life span. The ship normally only goes 7 years between refueling and refitting. Backed up with emergency fusion plants. Cargo: Cargo holds are scattered about the ship that allows for carrying up to 2,000 tons (1,814.36 metric tons) of cargo in addition to standard compliment of supplies and ammunition. Each enlisted crew member has a small locker for personal items and uniforms. Ship’s officers have more space for personal items. Most of the ship’s spaces are taken up by extra ammunition, armor, troops, weapons, engine, and other equipment. Market Cost: An unmodified Everest would cost about 2.1 billion credits to manufacture in present time in the Three Galaxies. Upgrades cost 1.2 billion credits and if the ship was constructed new it would cost about 2.8 billion credits. Cost does not include embarked craft. Two (2) 30 cm Main Heavy Laser Cannons: In the front of the ship are two 30 cm laser cannons. They are used as anti-capital ship weapons and can take out frigates in one shot and can do large amounts of damage to bases or larger starships. The Laser cannons can be combined together or each one used separately. The weapon system cannot be used to engage targets while traveling at faster than light velocities. Weapon has standard penalties to hit fighters and small targets for large starship weaponry. These can be fired forward and can be angled up to 120 degrees aft (can only fire one cannon at a target at that angle but can spin to be able to bring both batteries to bear) and can fire at a 30 degree angle up or down. Four (4) 20 cm Secondary Heavy Laser Cannons: These cannons are mounted in the sides of the ship and are used as anti-capital ship weapons and can take out frigates in one shot and can do large amounts of damage to bases or larger starships. The Laser cannons can be combined together or each one used separately. The weapon system cannot be used to engage targets while traveling at faster than light velocities. Weapon has standard penalties to hit fighters and small targets for large starship weaponry. The barrels can be fired either forward or behind and can be rotated 60 degrees horizontally or vertically. Mega Damage: 1D4x1000 M.D.C. each and two can be combined for a total of 2D4x1000. Two (2) 8 cm Heavy Rail Guns: Used as one of the ship’s secondary batteries. They are used against targets that are impervious to energy as well. System can be operated by a gunner or a gunner program (+2 to strike, 3 Attacks per melee) and can rotate 180 degrees. Rail gun projectiles come out of the heavy rail guns at a significant fraction of the speed of light. The weapon system cannot be used to engage targets while traveling at faster than light velocities. Two (2) 12 cm Heavy Laser Cannons: Laser cannons are used against frigates and as against heavily reinforced targets. One is located on either side of ship. Weapon has standard minuses to hit fighters and small targets. The barrels can be can be rotated 180 degrees in all directions. The weapon system cannot be used to engage targets while traveling at faster than light velocities. Mega Damage: 2D6x100 M.D.C. each or 4D6x100 for both. Six (6) 25 mm Point Defense Particle Beams: These weapons are used for anti-missile, anti-power armor, and anti-star fighter defense. Each particle beam is mounted in a ball turret that can rotate 360 and has a 180 arc of fire. While not as long ranged as the heavy point defense rail guns, they still have excellent range and unlimited payload. The weapon system cannot be used to engage targets while traveling at faster than light velocities. Four (4) Point Defense Tachyon Scatter Beams: The main purpose of this system is as an anti-missile point defense. They fire a beam which can potentially destroy an entire volleys of missiles before the strike the ship (Roll once against a volley and unless the missiles roll to dodge greater than strike roll, they are all destroyed.) The stream lasts for significant fraction of a second and missiles tend to run into the stream (Gives +4 bonus vs fast moving targets such as missiles.) This system has an interesting property that the system can actually be used at faster than light speeds because tachyons travel faster than the speed of light. Each tachyon scatter beam mount is in a turret that can rotate 360 and has a 180 arc of fire. Four (4) Long Range Missile Batteries: Missiles have a top speed of Mach 20 in an atmosphere and have an acceleration of 8% of light per turn (faster than any starship) in space. Whether missiles can be shot down is calculated from the speed of target, launcher, and missiles. When drive goes dead, missiles will continue to travel in a straight line unless set to self destruct but has very low odds of hitting star ships bases and planets because target does not move and missiles, when unpowered, are at -25% to be detected.) Long range missiles do not have penalties to hit small targets, unlike cruise missiles, and are almost always smart missiles. Batteries can launch on multiple targets each at the same time. Payload: 960 total, 240 long range missiles per launcher. Payload: 320 per launcher for a total of 1,240 medium range missiles. Image drawn and copyrighted by "DevilDalek." Copyright © 1999, 2008, 2011, & 2017, Kitsune. All rights reserved.